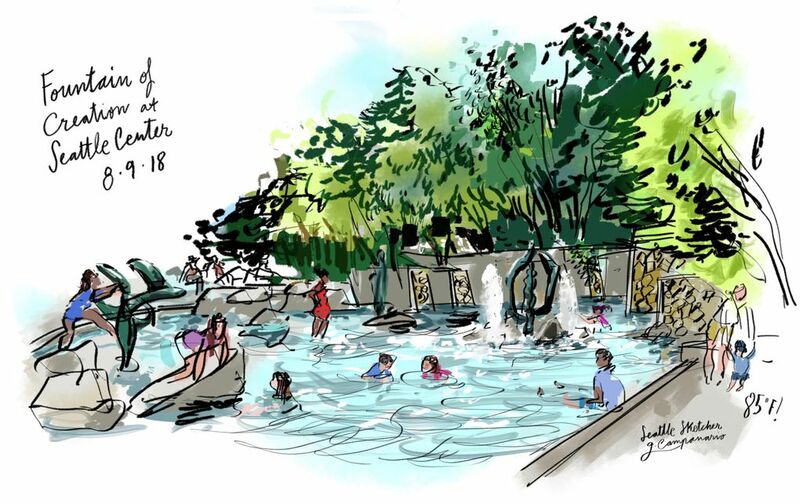 Toasty temps in the high 80s and low 90s have inspired Gabriel Campanario to look for city fountains that add a refreshing note to the concrete jungle. 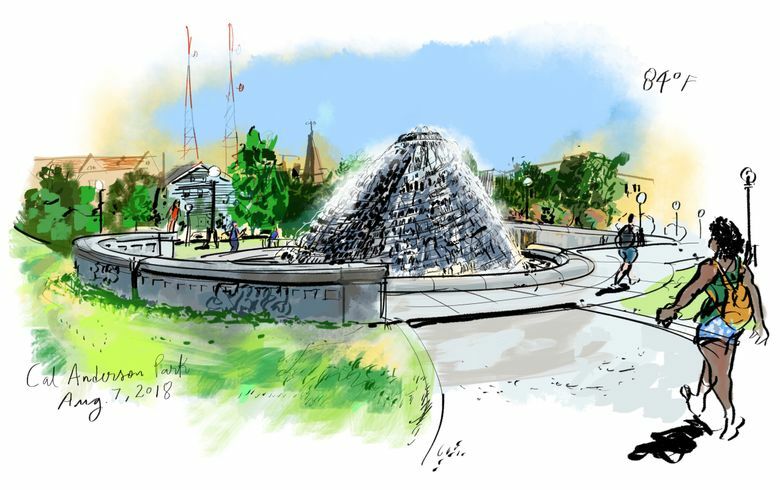 When I half-jokingly tweeted from Cal Anderson Park that I couldn’t take the heat anymore, someone replied that I’m probably one of those who also complains when the winter comes. True, in the winter I complain about the lack of light! But I’ve experienced much more unbearable summers in places where I’ve lived before, from the scorching desert of the Coachella Valley in Southern California to steamy Fairfax County outside Washington, D.C. So I have to take that tweet back. I do tolerate temps in the 80s, 90s and even 100s. I’m just getting spoiled after more than a decade living in Seattle. That thing they told me, that it never gets hot around here, doesn’t seem to hold true anymore. At least not this week, when toasty temps in the high 80s and low 90s inspired me to look for city fountains that add a refreshing note to the concrete jungle. Reader suggestions have poured from Facebook and Twitter, so I’m starting to make a list. For now, here are two more, in addition to the sparkling mountaintop at Cal Anderson that I’m especially fond of. 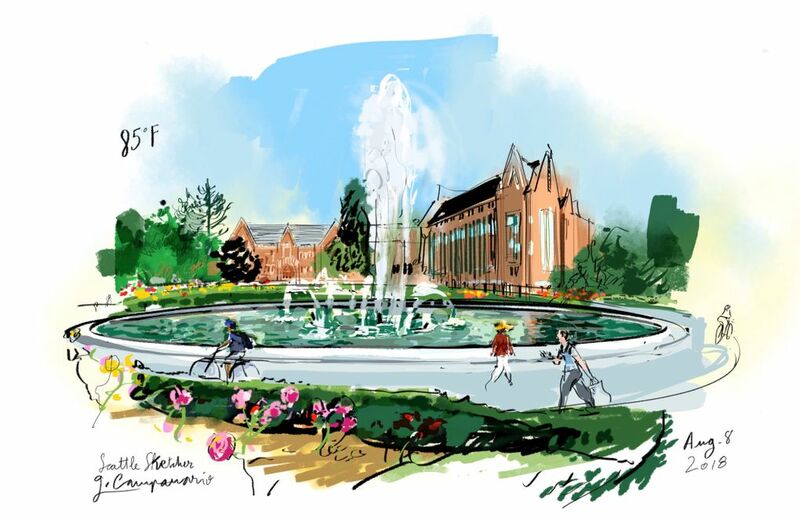 The majestic Drumheller Fountain at the University of Washington stands out for its grand design and powerful geysers, not to mention the picture-perfect backdrop it creates when you can see Mount Rainier in the distance on clearer days. But it’s not for playing in. The Fountain of Creation at Seattle Center is tucked away on the north side of KeyArena and easily overlooked in favor of the grand International Fountain. The design of this artful stone-and-water garden was directed by renowned modernist architect Paul Thiry and includes beautiful sculptures by Everett Dupen. On hot summer days it becomes a fun playground where kids can splash around and forget about the heat.